Looking like a pint-sized elephant ear plant, exotic alocasia odora can be tucked into almost any sized landscape for an instant jungle accent. 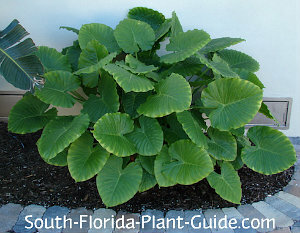 If you love the look of elephant ears but don't have the room, this plant's for you. 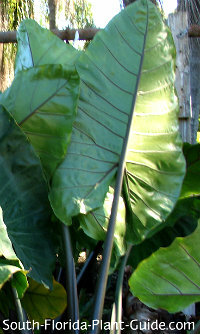 It only grows to 3 or 4 feet tall, unlike the colossal and classic Elephant Ears (colocasia). 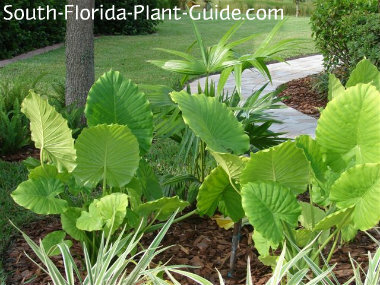 Alocasia is easy care in the right location. It takes sun or shade but seems to do best in part shade where it might get early morning or late day sun, mixed with dappled light through the afternoon. These plants do spread but not in a way that will get out of hand. They look very beautiful when left to naturalize in a deep bed. Alocasias are often referred to as elephant ears because many varieties look very similar. But other alocasias include some with dark purplish leaves and others with showy veining. Pictured to the right is one of the latter types, Alocasia amazonica - sometimes called African Mask plant - with striking deep green pointy leaves and white veining. 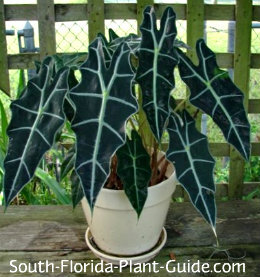 Pictured left is another striking variety - "Black Stem Alocasia" - which grows very large, with deep gray stems and veining. The odora variety is the best one for most landscapes because of its reliable growth and "just right" size. This moderate grower can be planted anywhere in South Florida, though it may die back when cold weather hits. For leaves year round, grow in Zone 10. 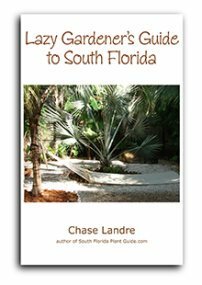 Plant in a protected area so winter takes less of a toll and wind doesn't damage the leaves. These plants tend to prefer a part sun to part shade location, and grow to about 3 or 4 feet. The only trimming needed is to remove a dead or dying leaf and stem now and then. Water on a regular basis...and do it more often for plants in full sun. Fertilize 3 times a year - in spring, summer, and autumn - with a good quality granular fertilizer. You can supplement feedings, if you like, with liquid fertilizer. Place these plants about 3 feet apart and 3 feet away from the nearest shrub. Come away from the house 2 feet. Come in from walks and driveways 3 feet to allow for future growth. Alocasias work well in containers as long as you can keep them well watered. 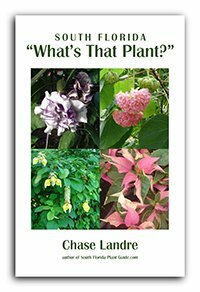 COMPANION PLANT SUGGESTIONS: Caladium, fishtail fern, Australian tree fern, downy jasmine, blue porterweed, dwarf azalea, and dwarf chenille.